$33 Promotional Gift Card available on this product! The most important factor in choosing a size of a Helite Turtle Vest is your height so the inflatable parts of vest that pass around your torso are in approximately the right place. The snugness of the vest is highly adjustable with Velcro straps in front, so your belly/chest sizes are of secondary importance to getting the right fit. Those with average proportions will find that the vest they choose based on height will also be the size they normally wear in men’s clothing. We’ve listed the height ranges for each size below. There are two “plus” sizes offered in the vest for those that are wider than average. We’ve listed some approximate chest measurements to help you decide if you need a “plus” size or one of the standard sizes. These vests are equipped with a VERY robust CE Level 2 back protector, so if your riding jacket has back protector in it already, you’ll probably want to remove it for use with the Helite vest. So do your measuring after removing the back protector from your jacket. Here are some fit tips from Helite: The vests are made to be long enough to sit on, but you do not want the rib protection so low that it’s covering below the waist in the front. The other fit to avoid is wearing the vest to small so it rides up high under the arms. The vest should have a loose fit and be long enough to cover the hip and pelvic areas in the event of an accident. You’ll notice some overlap between sizes. With the range of vest adjustments possible, it is very likely that you can comfortably fit in two sizes. Deciding which to order will depend on your usage… if you require extra room for looser fitting jackets, go with the larger size. If you’ll only be wearing the vest with lighter layers or a leather racing suit, we suggest opting for the smaller size. The Helite Turtle Airbag vest lets you add air bag technology to your existing riding gear package. Helite’s website is a great resource for technical information and to answer a wide range of FAQ’s you may have, so we encourage you to explore the information on their site. But buy it from us!! :) Oh, and lets get this out of the way right up front: go ahead the click the video to see it inflate! The vests offer easy adaptability to all our existing riding gear. You just wear the vest OVER your gear. The operation and maintenance of the vest is straightforward so anybody can understand how it all works. And being a mechanically triggered device, it has inherent reliability. 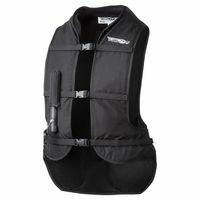 The vests include a CE Level 2 back pad that for most will be an upgrade to your existing gear. The vest can deploy more than once without having to return the vest to the factory for servicing (see details on Helite’s website). The vests are well made with robust materials and should last a long time. Warranty service is available directly from Helite in the US. Last but most important… ITS AN AIRBAG FOR YOUR BODY!!! You have to remember to connect the lanyard each time you mount up! PS: If the cons for the vest listed above give you pause, consider one of Helite’s jackets or vests which integrate the air bag parts within the jacket or vest.